Without further baiting or delay, here is part one of my new serial story. No… It doesn’t end at the end. Like life, there will be more. See currently published parts and planned parts on the Rue From Ruin page. I despise Bordeaux. It’s so… so warm. Warm and… beautiful. The sun mocks me with its cheerful rays making my customary black overcoat intolerable. Give me a chilly highland night or even an early summer evening in Seattle over this rubbish any time. Aside from that, Bordeaux is French, and I never fancied the French with their stinky cheeses and wines and their turned up noses. Still, here I am. Smack in the middle of the south of France searching for him. He had been here; that much is obvious. I turn a corner, following my instincts and almost walk straight into it. A SIGN. Funny thing about signs is that, sometimes, they actually, really, and truly are signs, and not just portents of something mysterious or sinister. This one’s blue and white like all the street signs in the area. Of course, it doesn’t look out of the ordinary to anyone without the sight. Even to me it seems innocuous enough unless I read the pale words. The grit and grime of years clings to it and yet the painted metal is not old at all compared to the wall where it hangs. Being from the new world, it has taken some time to get used to how ancient everything is in Europe. After traveling here many times on my hunt, I’m now shocked by the appearance of something new and modern among the decay. I turn my attention back to the sign and read the words inscribed though each one hits me like a left jab to the gut. 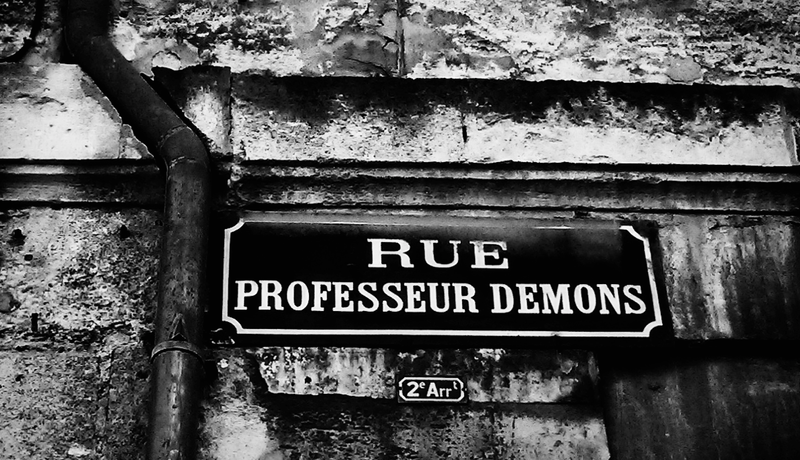 Rue Professeur Demons. He has been here and left his mark. I haven’t learned yet if it is intentional, the way his trail taunts me, or if he has no control over it himself. I only know the grief-stricken agony it causes me when I think of the way this monster took me in as an “apprentice” and then killed my family and tried to kill me. By tried, I mean nearly succeeded. I still have to drink a tincture of foul-smelling (and tasting) liquid each night, or I can’t even move the next day. It’s the only thing that protects my sanity. To confirm my discovery, I pull aside a man passing on the adjoining street and point, asking him in my broken, Googlized French, “S’il vous plaît, ce qui est cette rue?” Roughly: what is the name of this street, please? He looks at me in that disgusted way that French people reserve specifically for large, gruff outsiders who pull them aside and ask them silly questions. A sprig of something forgotten and green dances in his teeth as Mr. Stereotypical replies, pointing with a jabbing finger. Pointing to the plainly visible sign he says, “Rue du Professeur Demons.” He spits at my feet before wrenching free of my grasp and hurrying on his way leaving me dumbfounded. A dead end? How is this possible? There is an actual street in this city with this name? He must have known. He must be onto me. It’s too good, too well planned, to be otherwise. His trail brings me to Bordeaux and is going cold while he slips by on the merest technicality. Hell, maybe this is even where his curse originated. Tomorrow is going to be a waste now. Tomorrow I’m going to be a wreck. I’ll have to forgo the tincture and Bordeaux will likely pay for my choice, but it will be worth it when I pick up the trail. Tonight, the moon will rise. Tonight, I will track by scent. Now, where to stash these clothes? On to Rue From Ruin – Part 2!